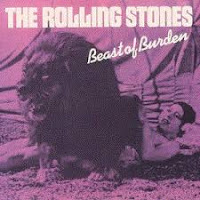 In Medias Res: Songs of '78: "Beast of Burden"
Twice before I've showcased my love for Some Girls. There are songs that came out in 1978--whether I remember listening to them on the radio 40 years ago, or have built them retroactively into my memories of that year--while I love more than any of these Rolling Stones tunes, that's for certain. But the album as a whole holds, nonetheless, an untouchable mystique too it, I think. In fact, Some Girls embodies my Platonic vision of the Stones--Mick, Keith, Ron, Bill, and Charlie, having survived the 1970s (almost! ), all of them still standing, still in possession of that bluesy energy, that sexual power, that rock and roll groove, that English naughtiness which launched them into the stratosphere with their great albums of the late 1960s. I will respectfully listen to and often really like just about any recordings by the Stones, from the mid-1960s up through the mid-1990s--but it is this album, which Jagger mainly conceived and orchestrated alone (Richards was dealing with the fall-out of his arrest for drug possession in Canada), reflecting influences of punk and funk and the times in general, that I think represents their peak. And "Beast of Burden," released as a single 40 years ago today, just might be its peak track. It's interesting that "Beast" was mainly written by Richards, though Jagger played with the lyrics and the tempo, turning it into the slow, almost-but-never-quite punky jam which we know and love. It was certainly the first Rolling Stones song I memorized, and I make no apologies to singing it, shamelessly and at great volume along with the song as it came off my precious Some Girls tape as I drove Melissa somewhere on a date way back in 1993. She married me, so it must work at least a little bit. So Mick, Keith, and everyone else--thanks!